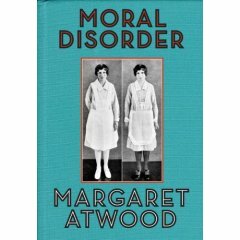 Moral Disorder is Margaret Atwood‘s first collection of short stories since Wildernis Tips, and it centers on the story of one woman or girl who grows up in the 1930s. It takes us from her childhood through her old age. It’s basically a family novel, and very funny, but also very sarcastic — and very personal. It might be something for — how should I say — more for women than for men, and more for the 40 year olds than for the 20 year olds — that would be my guess. But I’ve been reading her for a long time, and I really think this is a good one. I can recommend it because they’re short stories. The vocabulary is quite difficult, but they’re short enough so you can take them just one at a time. I’ve put some of that vocabulary up here on this site. When you read English, read each paragraph as a whole before you worry about the vocabulary. If you understand most of what you have read, go on to the next paragraph. Looking up words takes time. When you do look up words, make a pencil mark in your dictionary so that if you look up a word and find that pencil mark, you’ll remember and realize: I need to learn this word.